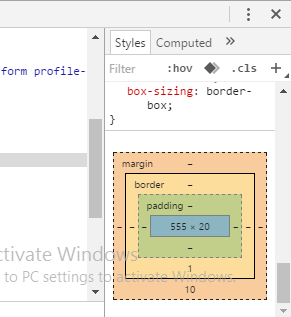 I don't edit CSS very often, and almost every time I need to go and google the CSS box model to check whether padding is inside the border and margin outside, or vice versa. (Just checked again and padding is inside). When working with CSS finally drives you mad the padded cell that they will put you in has the padding on the inside of the walls. You are using a box. If you were putting something in a box you would put some padding inside to make sure it didn't smack against the sides. Margin would then be the other thing. Print the diagram from the Box Dimensions section of the specification, and put it on the wall. To me, "padding" just sounds more inner than "margin". Perhaps thinking about the printed page would help? Margins are areas on the far outside - generally, you cannot even print to the edge - they are unmarkable. Within those margins, the content could be padded to provide an extra barrier between the content and the margin? Once you work in CSS enough, it'll become second nature to remember this. Padding is usually used inside. Either on the interior of a wall or a delivery box, that's simple. And if padding is inside, then margin is outside. Shouldn't be too hard. I've just learnt it over time - the box model is fairly simple but the main reason people find it hard is because body doesn't visibly break the model. Really, if you give body a margin and a background you should see it surrounded by a white strip. However this isn't the case - body's padding is the same as margin. This establishes a few incorrect things about the box model. padding = space inside the box. Tim Saunders gave some excellent advice - when I first got started with CSS, I made a point of building a good, fully commented base stylesheet. That stylesheet has changed many times and remains a terrific resource. use firebug to help you see. Create yourself a commented base stylesheet which you can use as a template whenever you need to create a new site or edit an existing site. You can add to it as you grow in knowledge and apply it to various different browsers to see how various things behave. You'll also be able to add in comments or examples about other hard to remember stuff or stuff that is counter intuitive. Add border, even just temporarily. As you play with the numbers, you'll see the difference. In fact, temporary borders around elements is a helpful way to work, such that you can see why floats are dropping, etc. I know this is an answer to your question, but more of a tip. Whenever I am dealing with margin and padding, I will add a border around the part you are working with, then from there, it shows me the room I have to work with. When I am all set, I remove the border. PAdding is a PArt of an element's PAinting: it extends the element's background. It makes sense to think of a pair element+padding as sharing a common background. Padding is analogous to the painting's canvas: the bigger the padding, the bigger the canvas and therefore background. Border (the painting's frame) would go around that pair. And margin will separate paintings on the gallery wall. Thinking about the concept of object background helps glue the pair object+padding together. The usual explanations of what is inside vs outside do not stick to memory: after a while everybody gets back to the original confusion. Remember also that margins are vertically collapsible and padding is not. Instead of ask again and again to google you just use inspector window. In that style tab and scroll down to bottom you can see like this. Margin:When you want move the block. Padding: When you want move the items within a block. I would like to support keyboard shortcuts in my WPF XBAP application, such as Ctrl+O for 'Open' etc. How do I disable the browsers built-in keyboard shortcuts and replace them with my own? 1497 How to resize navbar in bootstrap IE Only? 5768 CSS - Why is Border not Working? Does Sublime Text support live editing of CSS/SASS files? Declare a void function in C? Can anyone recommend a simple Java web-app framework? Why are ReferencedSymbol's Locations empty? How do you translate this regular-expression idiom from Perl into Python? How to implement drag-n-dropping widget to another container in qt?